A film which braves to speak to you rather than showing to you. Reminds me of HOTEL RWANDA and you contrast it with IN MY COUNTRY, the director braves to show so little but speak so much in form of stories told over and over again and every defendant getting off saying "I was just doing my duty". Something which is unimaginable in any other parts of the world hallowed with a slithered past, 'ubuntu' seems to be inspiration on which reconciliation is based in South Africa. 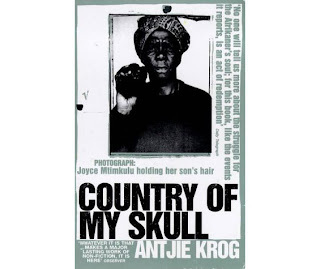 Its 1995 in South Africa, the Truth and Reconciliation Commission hearings -- agents, torturers and other apartheid personnel were brought face to face with the families of their victims, and, upon giving truthful confession of their crimes, could be granted amnesty. The past is revisited, but not recreated in visuals, it is only told before the commission, the commission takes to the interiors of the country and how do the people keep a tab on the stories? - By listening to the radio, the radio broadcaster-Juliete Binoche, a poet and radio journalist who supports the trials—although they are hard on her as she feels increasingly guilty for her ignorance of (and her family's complicity in) the government-sanctioned torture and murder. Samual L. Jackson also enters the arena with his own baggage of preconceived notions and for him the very presence of Juliete in the commission is repulsive until he takes her to the bed to find out the real reason. Basic Plotline:John Boorman's "In My Country" is set at the time of the commission's hearings, and stars Samuel L. Jackson as Langston Whitfield, a Washington Post reporter covering the story, and Juliette Binoche as Anna Malan, a white Afrikaaner who is doing daily broadcasts for the South African Broadcasting Company. As the commission and its caravan of press and support staff travel rural areas, Whitfield and Malan find themselves in disagreement about the Commission, but strongly attracted to each other.